Some people plan to celebrate Canada's 150th birthday with fireworks. Others will opt for community barbeques. 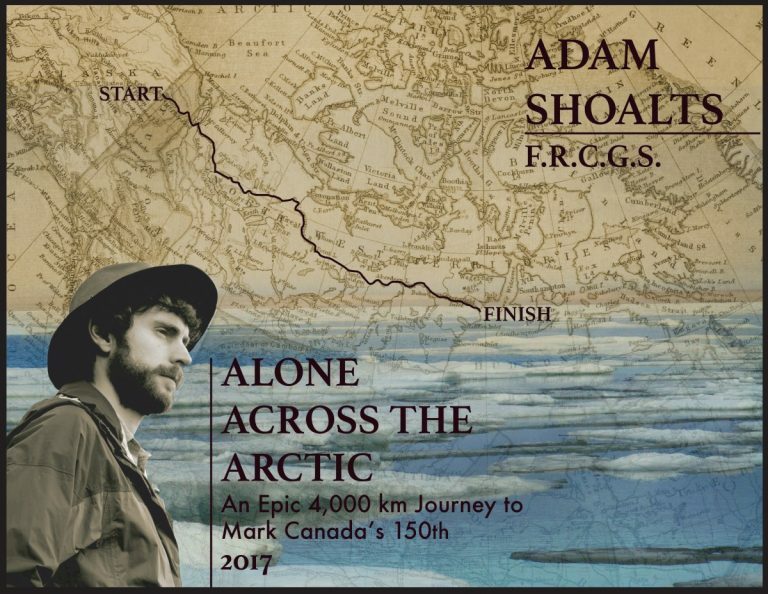 Adam Shoalts, explorer and Fellow of The Royal Canadian Geographical Society, has chosen to fête the sesquicentennial by spending five months alone in Canada’s mainland Arctic. Starting in May on the international border between Canada and Alaska, Shoalts will embark on a solo journey eastward along the Arctic Circle, arriving at Hudson Bay in September. In the 4,000 kilometres between point A and point B, he'll encounter mountains, rivers, tundra, and subarctic forest, not to mention wildlife. He will move on foot, by pack raft, and canoe. To accomplish his goal – christened the Alone Across the Arctic expedition – he must fundraise $12,000, 90 percent of which will go toward airfare to and from his remote start and end points. Canadian Geographic talked to Shoalts about the expedition and what it means to him. What gave you the idea to do this expedition? How are you preparing for the expedition? I’m preparing in what I guess you could say is quintessentially Canadian fashion—by lacing up my skates and getting out on the local rink 3-4 times a week; strapping on my snowshoes and going for daily treks through the woods and regular camp-outs, in addition to a standard calisthenics and lifting routine. Mentally, I’m reading up on past explorers in Canada’s North and studying maps. Well I know what I’m not looking forward to: the period before ice break-up. That will make crossing the rivers difficult. But the weather is beyond my control so I just have to find a way. As to what I’m most looking forward to, that’s simple: just being immersed in nature. I love it. To be more a little more specific, two of my most cherished memories happened in the Arctic. One was crossing paths with a beautiful white wolf on a river in Nunavut; the other was seeing a wolverine in a tree. Having more experiences like that is something that motivates me to keep going. Why do you think it's important that people pay attention to the Alone across the Arctic expedition? I’m hoping my journey will inspire Canadians to care more about our country’s wilderness and also to encourage a new generation of Canadians to take a break from electronics and get outside and explore what Canada has to offer. Our wilderness is unlike anything else in the world—I think every Canadian should try to experience it at least once.